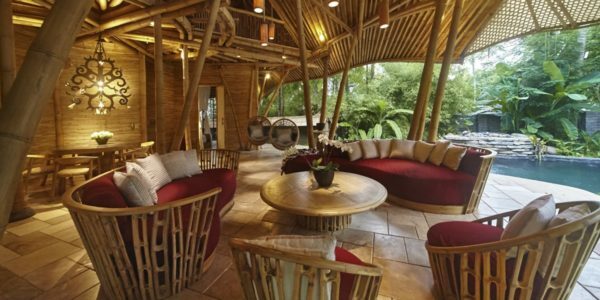 CACAO HOUSE is an elegant 3-story bamboo house in the enclave of Green Village, built within a wild cacao grove. The property is surrounded by a permaculture garden. The house features 3 bedrooms with en-suite bathrooms, and a bamboo guesthouse in the garden to host visiting family or friends. Enter the house at the ground level, where the rest of the home’s bamboo levels are stacked above you. A fully equipped kitchen with a designated dining area and a spacious open living room creates a warm welcome—suitable for entertaining guests before a dinner party. The pool is also located on this level, shaded by coconut trees. Across from the pool, in the garden, sits the bamboo guesthouse with glass-sealed walls. When you want to find solace from the tropical heat, a tubular bamboo media room provides entertainment with satellite TV and DVD player. Wireless Internet is available to support your daily working activities. On the top level, a semi-open space with bamboo flooring is the perfect spot for morning meditation or revisiting your yoga practice. Bathed with sunlight and overlooking the garden, it’s also a nice spot to wind down, read books, or have an indoor picnic with friends.